Demonstrators on the campus of Metropolitan State University of Denver protest President Trump's decision to end the DACA program. This week, President Trump finally made good on his campaign promise to end DACA — Deferred Action for Childhood Arrivals. This 2012 administrative program implemented by President Obama, has allowed about 800,000 undocumented immigrants who were brought to the U.S. as children to remain in the country. They're known as "DREAMers," after a proposed law that never passed. At least a third of them are, or have been, enrolled in college. So when U.S. Attorney General Jeff Sessions officially announced the end of DACA at a news conference Tuesday, an avalanche of criticism from the higher education community began in news releases, in emails to reporters and on social media. From community colleges to some of the country's most selective institutions, higher ed leaders were defiant. "It's disappointing, and it's just wrong at many levels," says Janet Napolitano, president of the University of California system. Napolitano, former head of the Department of Homeland Security in the Obama administration, says undoing DACA violates the constitutional rights to due process of students covered by DACA, so she is suing the Trump administration in federal court. In the meantime, says Napolitano, the University of California system will do all it can to reassure these students that their education, financial status and safety on campus will not be jeopardized. "We are going to continue to offer a DREAM loan program," she says, "and we are going to continue our directive to our campus police that they are not to serve as surrogate immigration agents." All 10 campuses in the UC system will also expand counseling and legal services this fall, especially to students whose DACA eligibility is due to expire. They have until Oct. 5 to renew their permits. In 2014, the Migration Policy Institute estimated about 241,000 people who were eligible for DACA were enrolled in college. Another 57,000 of those eligible at the time had completed at least a bachelor's degree. So the reaction from higher ed is not surprising. Trump has promised to be compassionate in dealing with DREAMers. But after DACA expires in March 2018, hundreds of thousands of students could eventually have to surrender their driver's licenses and their work permits and face deportation. Congress could keep that from happening by extending the program or replacing it with something else, but even then, Trump hasn't said what exactly he's willing to support. "Every day we hear something different," says Eduardo Padron, president of Miami Dade College. The uncertainty doesn't just affect students, says Padron, it affects institutions, because there's so little information or guidance in terms of what to tell students. "Because right now they feel in limbo," he says. "Nobody for sure knows what their options are." 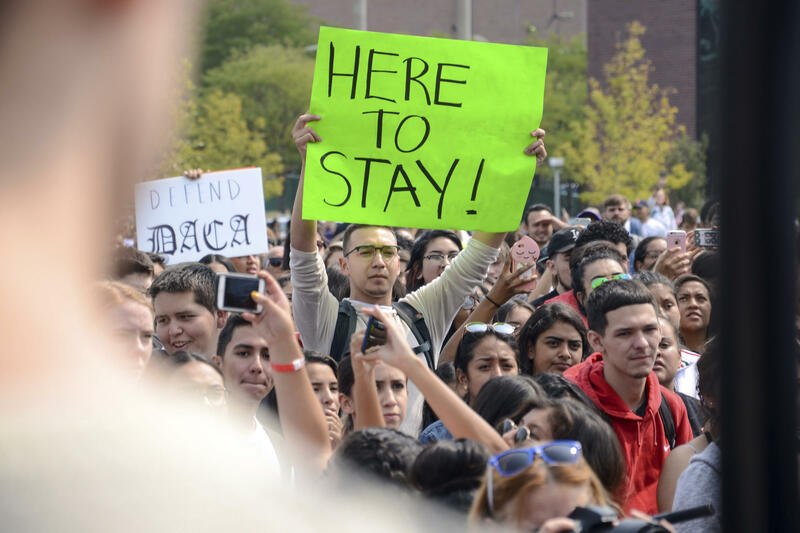 As head of one of the country's largest community college systems for the past 23 years, Padron says the plight of undocumented college students is nothing new. But DACA is different, he says, because it was supposed to open doors for deserving young people, not slam them shut. "These DREAMers are among the most dedicated and determined students," says Padron. "They make a lot of sacrifices. They graduate in significant numbers. They make us proud." About a quarter of a million DREAMers - young people covered by DACA, the Deferred Action for Childhood Arrivals - are enrolled in college this fall. DACA has permitted about 800,000 of these undocumented immigrants who are brought to the United States as children to work and to get an education. So when President Trump indicated he was ending DACA, the reaction from higher education leaders was swift. From the NPR Ed team, Claudio Sanchez reports. CLAUDIO SANCHEZ, BYLINE: It was left up to U.S. Attorney General Jeff Sessions to announce the fate of DACA. JEFF SESSIONS: Good morning. I'm here today to announce that the program known as DACA is being rescinded. SANCHEZ: Within minutes, an avalanche of criticism from the higher education community began - in news releases, emails to reporters and on social media, from community colleges to some of the nation's most selective institutions. JANET NAPOLITANO: It's disappointing, and it's just wrong at many levels. SANCHEZ: Janet Napolitano's president of the University of California system and former head of Homeland Security. She says repealing DACA violates the constitutional rights to due process of students covered by DACA, also known as DREAMers. So Napolitano is suing the Trump administration in federal court. In the meantime, says Napolitano, all 10 campuses in the University of California system will do all they can to reassure these students that their education, financial status and safety on campus will not be jeopardized. NAPOLITANO: We are going to continue to offer a DREAM Loan Program. We are going to continue our directive to our campus police that they are not to serve as surrogate immigration agents. SANCHEZ: Campuses will also expand counseling and legal services this, fall especially to students whose DACA eligibility is due to expire. They have until October 5 to renew their permits before DACA shuts down completely six months from now. There are 241,000 DREAMers enrolled in college today according to the Migrant Policy Institute. Another 57,000 have completed at least a bachelor's degree. So the reaction from higher education is not surprising. President Trump has promised to be compassionate in dealing with DREAMers. But after DACA expires in March 2018, hundreds of thousands of students eventually will have to surrender their driver's licenses, their work permits and face deportation. Only Congress can keep that from happening by extending the program or replacing it with something else. But even then, Trump hasn't said what exactly he's willing to support. EDUARDO PADRON: Every day, we hear something different. SANCHEZ: Eduardo Padron is president of Miami Dade College. He says this uncertainty doesn't just affect students, it affects institutions because there's so little information or guidance in terms of what to tell students. PADRON: We are holding some legal clinics in the next weeks for these students and their families to get legal advice because right now, they feel in limbo. Nobody for sure knows what their options are. SANCHEZ: As head of one of the nation's largest community college systems for the past 23 years, Padron says the plight of undocumented college students is nothing new. But DACA is different, he says, because it was supposed to open doors for deserving young people, not slam them shut. PADRON: These DREAMers are among the most dedicated and determined students at colleges and universities, not only here at Miami Dade College. They make a lot of sacrifices. They graduate in significant numbers. SANCHEZ: They make us proud, says Padron. Claudio Sanchez, NPR News. Transcript provided by NPR, Copyright NPR.